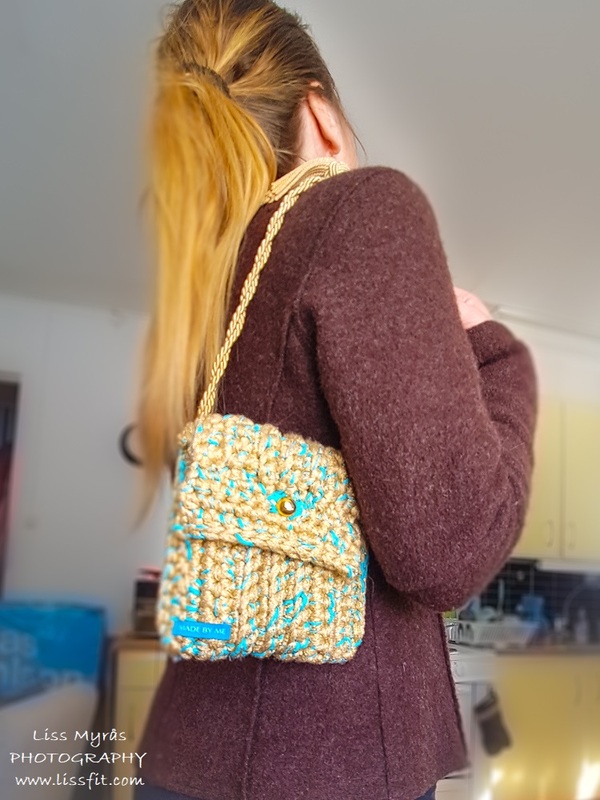 This easy crochet purse are all made of yarn, fabric, button and handles from second-hand shop. 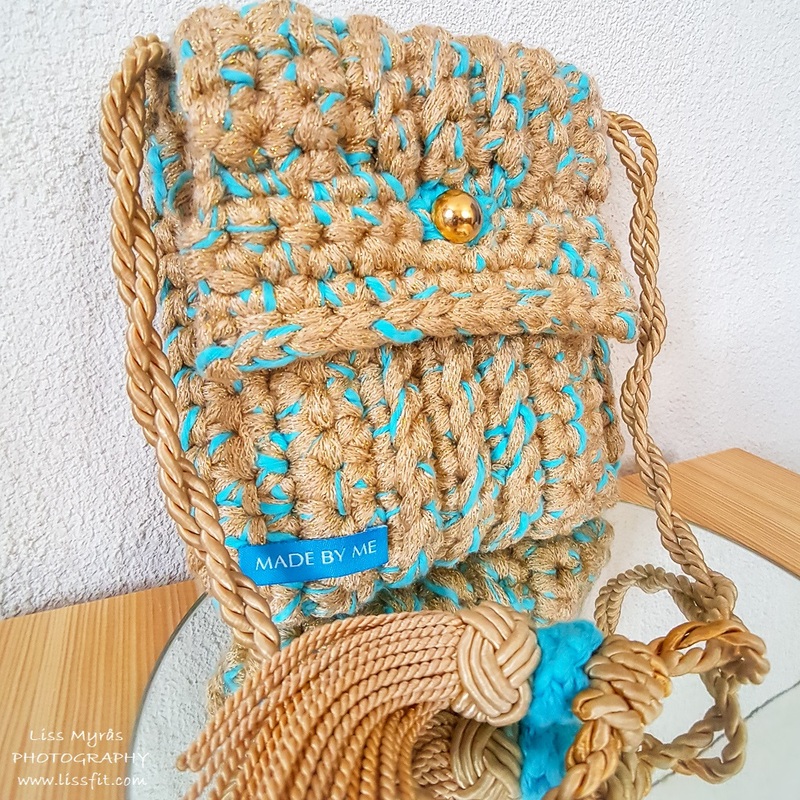 It is absolutely possible to crochet on real budget from time to time, and can, in addition to contribute to textile recycling, also result in a more fun crochet approach. I will not pretend that I am an angel when it comes to yarn, I too love to colour botanize, mix&match and plan ahead for crochet projects. But I also actively try to hinder my self from filling my home with yarn I actually don’t need only because it looks like eye candy.. some people seems to go totally bananas when it comes to yarn.. not sure if I should laugh or cry.. If there is anything we have plenty of in our world today, that is textiles.. so without being too fanatic I don’t mind trying to contribute a little to conscience re-use of textiles in this way too. Nice yarn, fabrics, buttons, handles, zippers, storage, baskets etc I get from second-hand and cost next to nothing compared to ordinary shops. I ex the best dish-cloth you can ever get are handmade one’s of cotton, so I made these two rags of that second-hand yarn, and I now clean my kitchen with pleasure.. well, almost.. So yes, when the opportunity occurs I absolutely LOVE to bargain fabrics, yarn, buttons etc in second-hand shops.. the best find I usually do in smaller second-hand shops/flea market, not the big crowded ones. I must admit, I do have slightly germophobia, but are learning myself to just give a crap in that! (having bug-loving animals inhouse helps too..ha..ha) And, some of the second-hand stuff I find is even brand new! 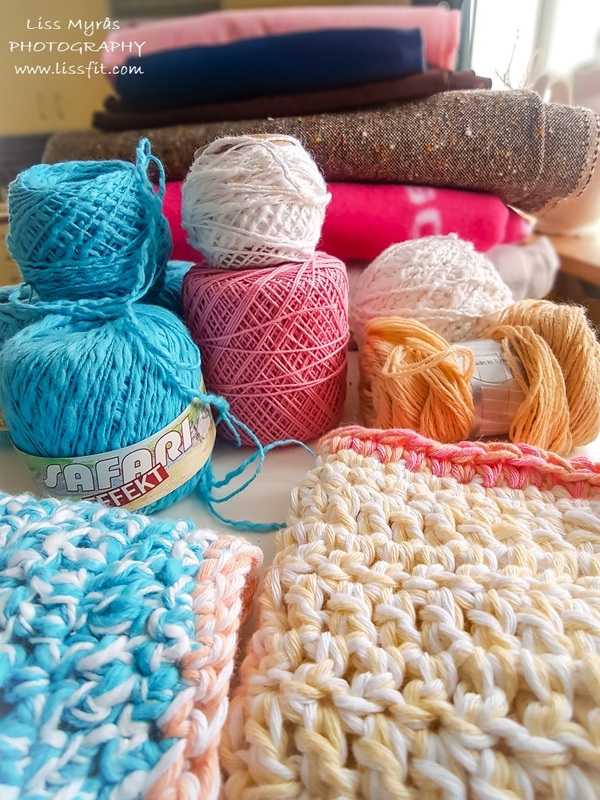 As an extra nice side effect I also discovered I get more impulsive, creative and have more fun crocheting when I don’t have to feel so “darn serious” handling treasures expensive yarn, heck.. even crocheting those dish clothes was fun!